"The Lord is my SHEPHERD. 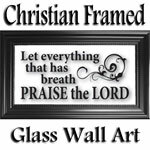 He makes me lie down in green Pastures, He Leads me beside Quiet Waters, he REFRESHES My soul - Psalm 23"
Framed glass with vinyl lettering. Black frame.